Adele pulled double duty at the Grammy Awards on Sunday night, first by kicking off the show with her smash hit “Hello” (which went on to win the Song of the Year Grammy) before returning to the stage for a tribute to George Michael. And although her show-opener was redemption for last-year’s sound-plagued performance of "All I Ask," she had to restart her performance of “Fastlove” after hitting a few false notes at the chorus. “I know this is live TV” Adele said before cursing, apologizing and asking to begin again. “I’m sorry, I can’t mess this up for him,” Adele said of Michael, who passed on Christmas day last year. Fortunately, her second try was much better, as Adele brought her powerhouse vocals to a poignant, slowed down arrangement of Michael’s 1996 hit. 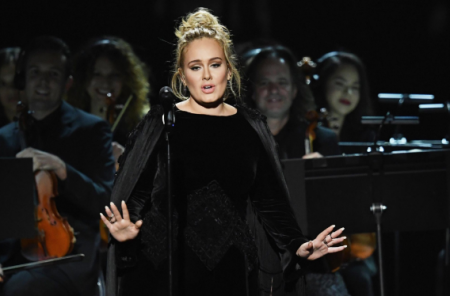 Check out videos of Adele’s performance below and keep it here on AXS.com for more coverage of the 59th annual Grammy Awards.